Samsung Electronics today announced the official launch of the striking and innovative Samsung Gear S3 smartwatch. At initial launch, the Gear S3 will be available in South Korea and will roll out in additional markets worldwide including Australia, Dubai, France, Germany, Singapore, U.K., and U.S. starting on November 18. The cutting-edge timepiece combines timeless design with the latest in mobile technology, and will be available in two designs – the rugged Gear S3 frontier and the modern, sleek Gear S3 classic. 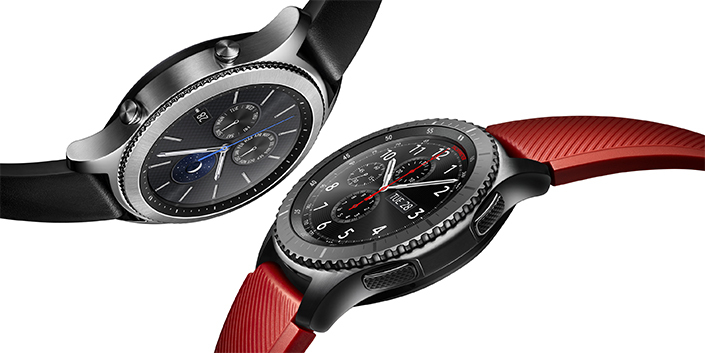 Both the Gear S3 frontier and Gear S3 classic take inspiration from traditional watchmakers, offering refinements in design, including Samsung’s trademark sleek circular bezel and carefully-crafted details on the watch face. Consumers can customize the watch face and switch the changeable 22mm watch band to fit their personal style. It also supports Always On Watch so the watch face always shows the time instead of automatically fading to black. Delivering the latest in mobile technology, the Gear S3 is IP68 water and dust resistant, and offers military grade durability. Equipped with a built-in GPS, as well as the S Health, Alti/barometer and Speedometer apps, users can track daily fitness activities and outdoor conditions from altitude and atmospheric pressure to sudden changes in weather, distance traveled and speed. Additionally, the long-lasting battery can last up to four days on a single charge. * Service availability and scope may vary by each region and market condition. ** Promotions may vary by each region and are subject to change without notice or obligation.